How To Transfer Your Whatsapp Chat History From iPhone To Android? Home Tips And Tricks How To Transfer Your Whatsapp Chat History From iPhone To Android? Gone are the days when we used to communicate via SMS and now Chat Apps have taken over SMS. Chat Apps have given us a reliable platform to interact with our family, business associates and friends. Irrespective of any transition like switching to a new phone, you would never want to lose your Chat history. Like many others you may use WhatsApp as your primary messaging app. In that case you may have some questions in mind bothering you like how to transfer your WhatsApp chat history? 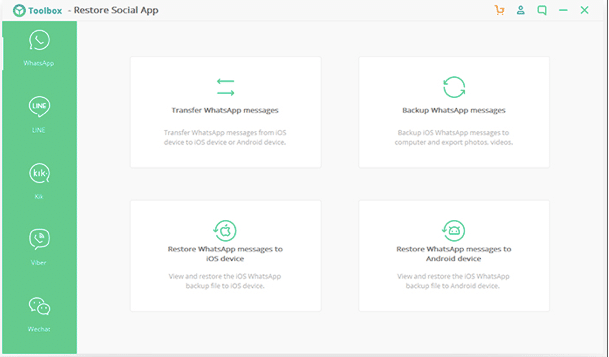 How to backup your WhatsApp chat history? The answer to your questions is iSkysoft Toolbox – Restore Social App that helps you transfer whatsApp from iphone to android. WhatsApp attachments of all formats. WhatsApp messages which include files, images and videos. WhatsApp chat history and documents. Firstly, you need to install iSkysoft Toolbox from the official site. Now, run the toolbox and just select the option- Restore Social App. Now select- Transfer WhatsApp Messages. Connect your iPhone and Android device. iSkyosft Toolbox moves your data from one device to another without data loss. You will find the transfer, backup and restore process simple and easy because after a few clicks the entire process is automatic. iSkysoft Toolbox is user-friendly software that gives you better control over your smart devices and Chat Apps. You don’t have to engage in trial and error process to search the right tool for transfer WhatsApp from iPhone to Android, back up or restore activities. iSkysoft Toolbox does it all for you. Now you don’t need to stop yourself from buying a new phone as the transfer is just a click away with iSkysoft Toolbox. 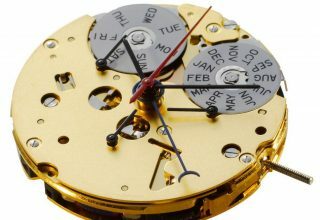 For any software, its device compatibility is checked before it is launched. iSkysoft is compatible with most devices iPhone, iOS 12, iPhone XS, XR etc. Mac OS X 10.13, 10.12, 10.11,10.10,10.9 and 10.8 iOS, Mac 10.14, OS 12, iOS 11, 10 and older versions. 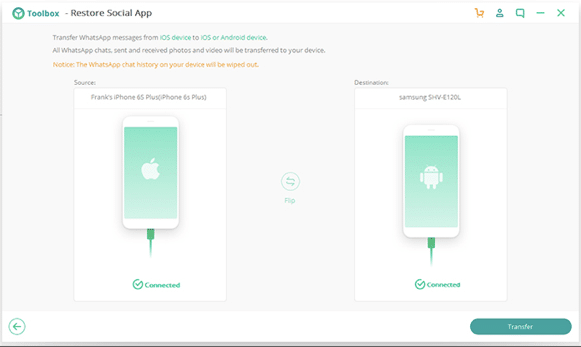 Apart from the process of transfer whatsapp messages from iPhone to Android, iSkysoft Toolbox allows you to transfer, backup and restore viber/kik/wechat/line messages between iOS and Android devices. LINE App – Backs up LINE chats, images, videos and LINE stickers faster. Restores backup content across various iOS devices. Viber – Offers Single click save and backup of chats, voice, images, videos and call logs etc and also restores backup content over iOS devices. WeChat – Backs up chat messages to your PC in just a click. Restore based on selection comes in handy. Irrespective of any Smartphone or messaging apps you are using, iSkysoft Toolbox is always there to help you transfer, backup and restore your messages and important data from one Smartphone to the other. iSkysoft lets you utilize its features to initiate transfer process securely to prevent data loss. It is indeed must-have software on the list of your favourite applications.